The Marine Mammal Protection Act was first passed in 1972. 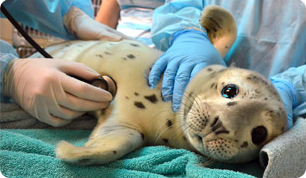 It mandated the creation of a stranding network of which The Marine Mammal Center is a member. Who responds to a stranded marine mammal is determined by the location of the animal and who is qualified to address the needs of that species. Marine mammals strand for a variety of reasons. Strandings may be small-scale events involving single animals, or larger-scale events involving dozens of animals. Strandings may be routine, caused by commonly seen injuries, diseases or malnutrition, or they may be extraordinary, caused by less common circumstances, such as marine mammals found on roadways. Some marine mammals strand because of harassment or injuries caused by humans, such as entanglement in fishing gear or marine debris, ingestion of plastics, gunshot wounds, or boat strikes. Some strand due to injuries caused by sharks or other natural predators. Many animals strand because of illness or disease, including viral infections such as herpes; bacterial infections such as leptospirosis; parasites; encephalitis; and cancer, to name a few. Still others strand because of natural or anthropogenic (human-caused) toxins in the environment. Sometimes young animals who have become prematurely separated from their mothers or who are recently weaned strand because they have not been successful in finding food. Other times, environmental and oceanographic events such as El Niño cause changes in distribution and abundance of marine mammal prey, thereby leading to malnourishment and stranding. The causes of stranding are numerous. As sentinels of the marine environment, marine mammals have a great deal to tell us about the health of our oceans. Stranded animals carry that message to us.